New York Accident Attorneys | Tantleff & Kreinces, LLP. Tantleff & Kreinces, LLP., was formed in 2012 and is the successor firm to Tantleff, Cohen & Tantleff, P.C. and Katz & Kreinces, LLP. Our boutique firm specializes in the areas of medical malpractice, automobile accidents, construction accidents, premises liability, wrongful death, products liability, and Real Estate. 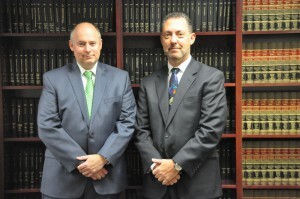 The attorneys and staff of our firm take pride in the personalized attention and care given to each and every client. Our firm represents clients in all five boroughs of New York City, Nassau, Suffolk, Orange, Ulster, Sullivan, Westchester and Rockland Counties. The majority of our cases are through referrals from colleagues and former clients who appreciate our care and dedication. We maintain offices in both Brooklyn and Mineola to provide for the convenience of our clients. The hallmark of our firm is,"We care about our clients." We do everything we can to obtain the most favorable financial results in the legal arena for our clients while addressing their individual needs in a thoughtful manner. Our firm has recovered verdicts and settlements which have helped to change the lives of many of our clients. Let us help you to change your life. "I appreciate all the work done by your firm, and I especially want to thank you personally for your kindness and consideration. As you know I was very happy with the amount of the settlement." "We want to thank you so much for always being there for us and we appreciate all you have done for us. Especially, when I was nervous, you always knew how to calm me down and make it very stress free for us. You are truly the best! It was great getting to know you." "We want to thank you so much for always being there for us and we appreciate all you have done for us. Especially, when I was nervous, you always knew how to calm me down and make it very stress free for us. You are truly the best! It was great getting to know you." J. R. & S.R. "At this time I wish to tell you what a pleasure it has been doing business with you. Both my husband and myself want you and your firm to know that we certainly have appreciated all of your help, courtesies and business professionalism. If we should have cause, we certainly will be in touch with your firm."